Once a week I run The Clip Club – http://theclipclub.co.uk – a non-formal film making/watching club in an East London primary school for Years 5 & 6 – about 8-10 of them. The above blog records all our activities and outcomes. I’ll be making observations on forthcoming sessions on this blog and the participants will be known as: Gg, Ch, El, Dw, Esh, St, Gv and the learning mentor Jn. The issuing of iPads remains the source of much excitement. This session they have their own, last session they were sharing. It alters the dynamic significantly in that there’s a scattering, a flurry of exchange and noise in the playground. They are told they can go outside and film – ostensibly to interview each other about the film making experience – but this is optimistic and things dissolve into what would be deemed in class management speak, chaos. They, dizzy with the freedom and the potential for control, me, questioning what I should be ‘allowing’: different perceptions of the course of events, all revolving around distributions of power. Gg keeps apart, sitting on the climbing frame, playing with Wordle. 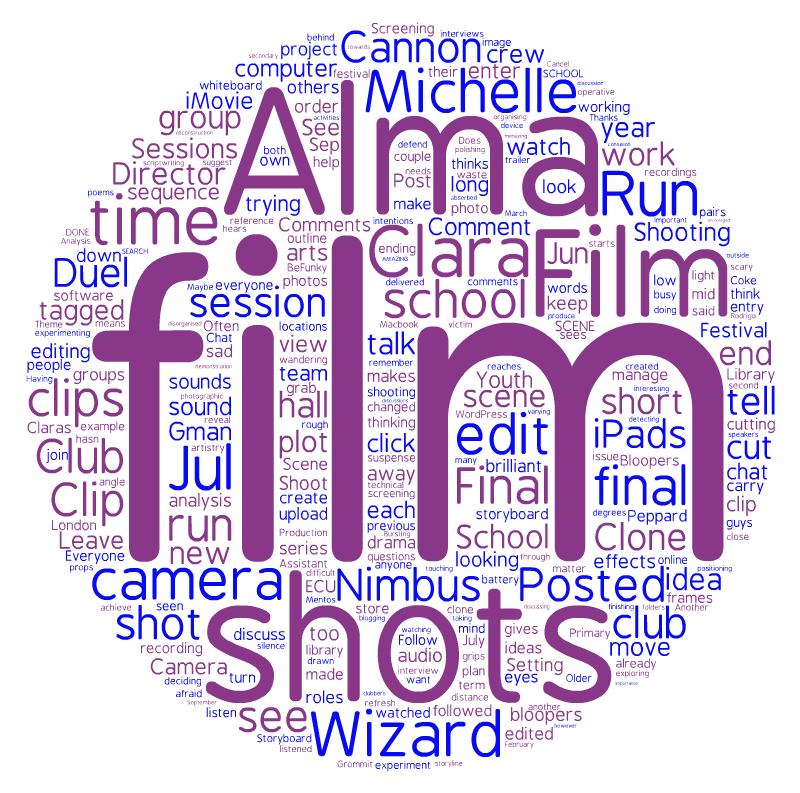 I’d introduced this and Tagul/Wordle to them earlier (hence the graphic left). He’s recognised as a computer “whizz kid” in the school – amongst teacher and pupil alike – and likes nothing better than to discover new apps, oddities and functionality with which to dazzle interested parties. Unlike the others in the group who have been referred, Gg is Jn’s son (the learning mentor). They strike ‘selfies’ on the climbing frame. This is enticingly subversive activity. I grab a couple of them and manage to film a haphazard interview. I’m going to need my own iPad to do this in future. With 5 minutes to go Gv finds a high angle and asks El some questions. All of this footage and photographic material can be used in a digital presentation I’d like them to make to the new incoming Year 5’s using the ‘Explain Everything’ app. This is with a view to embodying and being reflective about their learning. Interestingly, Jn is now using video to film ‘his’ referred boys in his own role as Learning Mentor. I wonder if I’d be able to use this material as research data? if it’s not been recorded by me in the research context? Jn has just emailed me saying that Gv and Esh seemed to focus on the safety of the equipment in discussions on what they think they learned in Tuesday’s session. This I put down to the discursive affirmations of the value, the sanctity, the fetishisation and the perceived fragility of techno-ware. Just capturing these fleeting thoughts reminds me of certain points made in my previous few posts about the Media Education Summit and power relations, about dissolving barriers between disciplines, about the social and about the necessarily porous pedagogy of the inexpert. Is there a connection between a creative free-form media project like this and a proto-critical frame of mind?